There are approximately three male economics majors for every female economics major nationwide. As a bright-eyed and optimistic frosh, I thought I would be one girl closer to closing that gap. There was no need for me to put away the T3i calculator after high school. For me, economics seemed to be the perfect marriage of mathematical concepts with creative problem-solving. When many think of economics majors, they think of the men who want to take over Wall Street with a new suit and a fresh cup of coffee. Two summers ago, I was a public finance intern for a wealth management company called BlackRock. While I was there, I met Maria, the only female managing director in the public finance department. She gave me advice about how to navigate the sexism that I would experience if I studied economics in college and pursued finance after. She told me to utilize the people and resources on my campus to manage the inherent sexism I would face as a woman trying to make it in the business world. 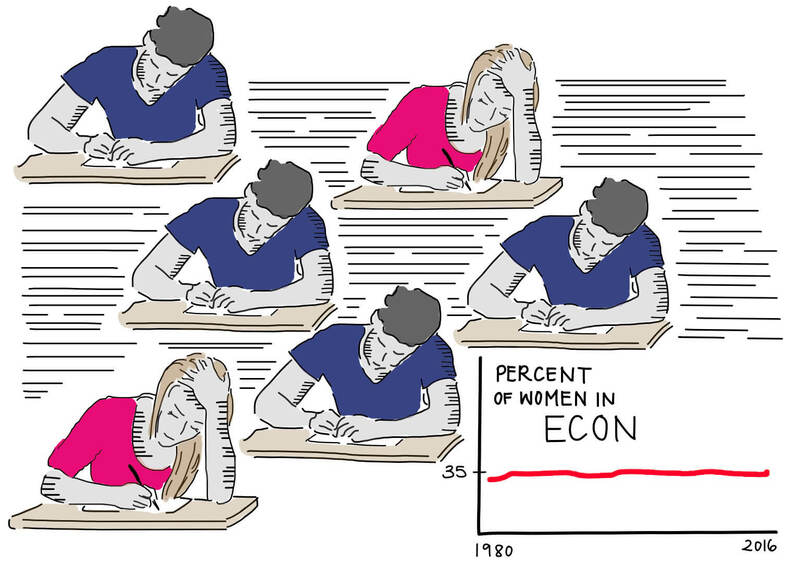 Today, inherent sexism in economics is not speculation, it’s reality. Maria’s advice continues to stick with me and has made me realize that I’m not getting the education and support that I need. As a fed up and let down sophomore, I am not on track to be an economics major anymore. I didn’t just decide to pursue another major because I found economics boring. It wasn’t just because many boys in my classes would bombard me with the wrong answers and try to prove to me and other female students that they were right. In short, since economics is the most popular major at Occidental, there need to be more academic and career-oriented resources for female economics majors. This will create a more healthy learning environment for female economics majors at Occidental, motivate women to purse economics or an economic related field and alleviate the gender disparity within the field as a whole. In the “Principles of Economics I” class I took the first semester of my first year, there was an almost equal number of men and women in the classroom. Professor Bevin Ashenmiller, my economics professor at the time, was the Senior Economist for Energy and the Environment at the White House Council of Economic Advisers in Washington D.C. I sought other people like her at Oxy, including both students and professors. I heard that there was a Women in Economics club and wanted to be a part of it. Under the economics department page, the department acknowledges that there’s a gap between the number of female students in 101–102 classes and those who continue on to be majors. Now that I’m taking upper division classes, I don’t get the same amount of support from the department or my peers. In my “Intermediate Microeconomics Theory” class, there are five girls out of the 22 people in the class, and we all sit in one specific area of the classroom. I’ve never felt more uncomfortable or isolated in a classroom setting. It’s not the professor’s fault, but rather the fault of the department as a whole. The department chair, Lesley Chiou, is a woman, which makes this problem especially disheartening. The courses are heavily reliant on quantitative skills, so it’s easy for gender-related stereotypes to arise. I would ask male peers how they got a particular answer, and they would tell me, “It’s easy. It’s just math.” There seems to be an unspoken expectation between men that they should all inherently know the answer — when chances are, they don’t. The nature of upper-division classes is unnecessarily competitive. I came to college to learn what I want to learn and ask the right questions. My interactions outside the classrooms made me feel discouraged inside the classroom. Especially when the math in microeconomics is difficult, and I feel like I can’t ask the questions I need to ask. My current microeconomics professor sent out an email the first month of school saying that the Women in Economics club was establishing a new mentorship program to build a network for women interested or majoring in economics to support each other. My friends and I filled out the form and have received no response to this date. They also did not hold any events this semester. In the Economics Student Association (ESA), they have hosted a POC Economics Alumni and a Senior Advice panel but no panels with just female economics alumni. If the goal of the club is to empower women in economics, they need to do more in order to achieve this. The Women and Youth Supporting Each other (WYSE) chapter at Occidental offers general support and Boundless Brilliance aims to empower women in STEM. We need organizations like these on campus that can help women recognize their potential in Economics. Also, some of my female economic major friends suggested holding a couple of workshops for women each semester. These workshops would be mixers where female economics majors could connect and network with alumni hosted by either ESA or Women in Economics. If current female economics majors had more opportunities to meet successful female economics graduates, it would encourage women to continue learning about economics if it’s something that’s of interest to them. It’s impossible that the inevitable sexism within the economics department will be completely obliterated. However, the school has a responsibility to recognize that this is a problem that needs to be solved and provide the resources to solve it.